The Earthwise 7.5 Inch TC70025 Electric Tiller is the best electric tiller you can buy for the value it provides. You have a wonderful garden. But it’s tough to keep it that way. Part of this hard work is when you have to get the garden soil ready for new plants. It’s not fun trying to till the garden with a shovel. The good thing is you don’t need to spend this much time and energy. With the right tool, you can get the work done fast and efficient. Let’s look at the best electric tiller you can buy that will help you with this. What is an electric tiller? What are the different types of electric tillers? Do you need an electric tiller? If you want healthy plants, you need good quality soil to grow them. This soil should have the right pH and nutrients. But it should also have the right texture. An electric tiller can help you loosen up the soil and bring such texture to it. It makes it easy to mix in fertilizer or compost into the soil as well. The cultivator is a type of electric tiller that is suitable for light work. It helps you turn the soil over in a small garden with minimal effort. If you’re looking for a more powerful electric tiller a garden tiller can help. It’s more powerful than the cultivator. So it can be used for a larger garden and for heavy-duty work. There are also sub-types of garden tillers such as front-tine, rear-tine, and vertical-tine tillers. The rear-tine tillers are the most powerful, the front-tine tillers work as an excellent mid-range option between garden tillers and cultivators, and the vertical-tine tillers are known for their speed. You may need to till the soil in your garden. Maybe you’re starting a new one. Or maybe the soil needs the occasional turning. That’s where an electric tiller can help you save the time and effort of tilling with a tool like a shovel. If you don’t enjoy spending a lot of effort on the garden soil, it’s a tool that will make your work easy. Let’s look at some characteristics of an electric tiller that can help you make a good buying decision. There are different types of electric tillers that are available and they vary in terms of performance. Most people require a cultivator for routine soil work. If you’re going to have to move plenty of soil within a short amount of time, the garden tiller is the way to go. The rear-tine garden tillers are particularly helpful to those homeowners who need to have as much power as possible. Electric tillers are not automatic machines. You will have to put in some work to operate them properly. Among the electric tiller options, the one that is easiest to use is the cultivator. It is a lightweight machine that is easy to operate. The rear-tine garden tillers are the toughest ones to work with. Homeowners looking for an in-between option may want to go with the vertical-tine garden tillers. It doesn’t take quite as much as energy to use them and they are also capable of working quickly. The type of soil you have in your yard may influence what type of tiller you buy. Lucky homeowners may have relatively soft or loose soil that does not contain plenty of rocks. This is the easiest type of soil to move and you can use a cultivator. 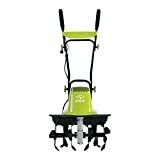 The cultivator is also a good choice if you have a smaller yard. If the soil is rockier, harder, and more densely packed, chances are that the cultivator will not be powerful enough to move it. You will require the power possessed by a vertical-tine tiller. Some yards can be very rocky and dense. Then you need to use a rear-tine tiller that gives good power. This is the same type of tiller that is best suited for working on bigger yards. According to Lowe’s, it is also important to pay close attention to the maximum tilling capabilities of the machine. You need to know how deep the machine can go and how much ground it can cover. Some tillers are only good for moving the small portions of the soil and that could prevent you from planting everything you want. If possible, you should look for an electric tiller that comes with an electric starter. It helps you save time starting it up and avoid straining yourself. Pneumatic tires are also good to have as well. They improve the machine’s durability and overall performance. An ergonomic handle is going to make it easier to carry out extended work. To protect yourself from small branches and other sharp objects that may be moved by the tiller, you will need to wear protective gear. The essentials include safety goggles and boots. You may also want to wear a mask to prevent from getting into a coughing fit and some earplugs can be helpful as well. Check the tiller itself for any possible problems. Make sure that every part is where it should be and that there are no damaged components. Make sure that there are no children or pets running around in your yard. Even if you can control the tiller, you can never be sure that it will work as expected all the time. If it’s raining or your yard is still wet from the sprinklers, don’t use the tiller just yet. The wet conditions could cause it to malfunction and you may have a ruined tiller at the end of the day. Before using your electric tiller, the first thing you have to do is read the manual. Even though most electric tillers may function quite similarly to one another, there’s still a chance that the model you have is slightly different. Check for any potential differences in the manual. With the manual reading out of the way, you can now start using your electric tiller. Since you’re using an electric tiller, the machine will have a button you can push to get it started. Now that the tiller is in motion, you can start moving the soil. When working on hard soil, you will want to have the depth regulator on the shallowest setting, according to Big Rentz. You can have the tiller set for deeper work if the soil is softer. You don’t have to do much if you’re just trying to dig into the soil. Allow the tiller to run in one place and it should burrow into the ground. If you need to move forward, you will have to pull the tiller up slightly so that it will go in that direction. Turning also requires pulling up the tiller but doing so in your preferred direction. Just like any other machine, an electric tiller needs proper care if it’s going to serve you for a long time. One of the most important things you need to do is to simply clean out the air filter. The air filter is responsible for ensuring that debris and other small materials do not get into the engine of the tiller. Foam air filters can be cleaned out regularly, but the ones that are made out of paper have to be replaced. Along with the air filter, you also need to keep close watch of the tines. Those tines are blades that cut and dig through your soil. To clean the tines, you can hose them down and then apply some lubrication. After a while though, the tines will inevitably lose their edge and have to be replaced. Make sure that you read the manual and wear some thick protective gloves before you proceed with replacing the tines. Keep an eye on the tiller’s tires as well. They may need to be reinflated after a while so that the tiller can work properly again. You will also eventually reach the point when the tires of the electric tiller will have to be replaced. At just 8.8 pounds, this Earthwise tiller is way lighter than most of the products you’ll encounter. You can easily work for hours in your yard using this electric tiller. It helps that it comes equipped with an ergonomic handle. It’s cutting capabilities are fairly decent – 7.5 inches for width, 6 inches for depth – but other electric tillers can offer more. The tines may look thin, but they are surprisingly durable. The weeds can get caught up in the tiller so you’ll need to stop it and get them out. The TJ603E Electric Tiller from Sun Joe has some pretty impressive cultivating capabilities. Backed by its powerful 12-amp motor, it can effectively dig into the ground. You can use it to move around 8 inches of soil. It can work on a space that is around 16 inches wide. The six angled tines installed on this electric tiller enable it to work that way. It’s also easy to store this electric tiller because its long handles can be folded. The handles are small which means you’ll feel strained after using the tiller for a while. The 27072 Corded Tiller from Greenworks manages to do its job without producing a lot of noise in the process. It’s easy to store or travel with this electric tiller because of its compact frame and foldable handles. This electric tiller lacks the high-end power you may sometimes need. For maintenance purposes, this is a good machine to have on hand, but if you’re looking to make big changes to your yard, a different tiller will probably have to be brought in. DOUBLE HANDLED: For stability and maneuverability. Easily access the exact patch of soil you need to till without damaging the surrounding area. SAFETY CUT OUT PROTECTION SWITCH: Stops the motor, preventing damage to the blades. 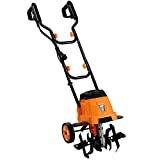 The Electric Tiller from VonHaus is an example of a cultivator that packs plenty of power. This machine is powered by an 850-watt motor. You can use this machine to dig nearly 9 inches deep into the ground. This electric tiller has double handles and it also features a safety switch that can be used to immediately stop the motor as well as the tines. Those steel tines are also sturdy and last for a long time. The wheels are made of plastic and not that durable. So you may have to replace them soon. 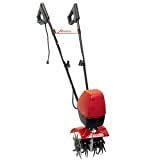 The Mantis 7250-00-03 electric tiller tries to balance power with the form factor. This tiller is remarkably slender. You don’t have to make a ton of room for it in your shed. And operating it is easy because your arms and hands can remain in a more natural position. It can also be folded up whenever you aren’t using it. In terms of power, this electric tiller can dig about 10 inches into the ground with relatively no issue. It can do that with the aid of its 540-watt motor. It possesses overheating issue and you will have to wait for it to cool down before using it again. The Earthwise 7.5 Inch TC70025 Electric Tiller is the best electric tiller you can buy in our opinion. It’s very lightweight weighing just 8.8 lbs and easy to use around the garden. The 2.5-Amp motor and steel tines are sufficient to use in small to mid-sized gardens. The grip is soft and you can use it for a long time in the garden without discomfort.